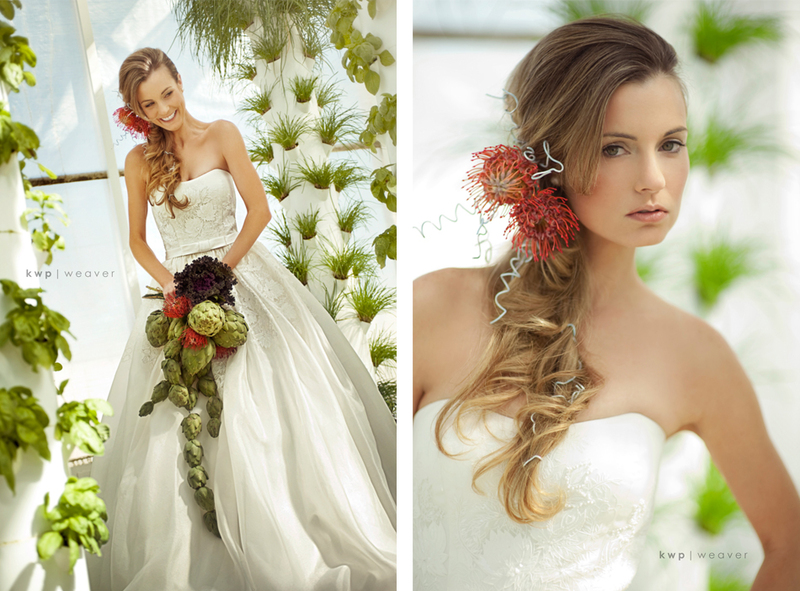 In February, I got together with some of the most talented vendors in Central Florida to produce a 6-page bridal editorial for Orlando Style Magazine. The issue just came out Thursday, so I finally get to blog about how awesome the shoot was, and how amazing everything looked! 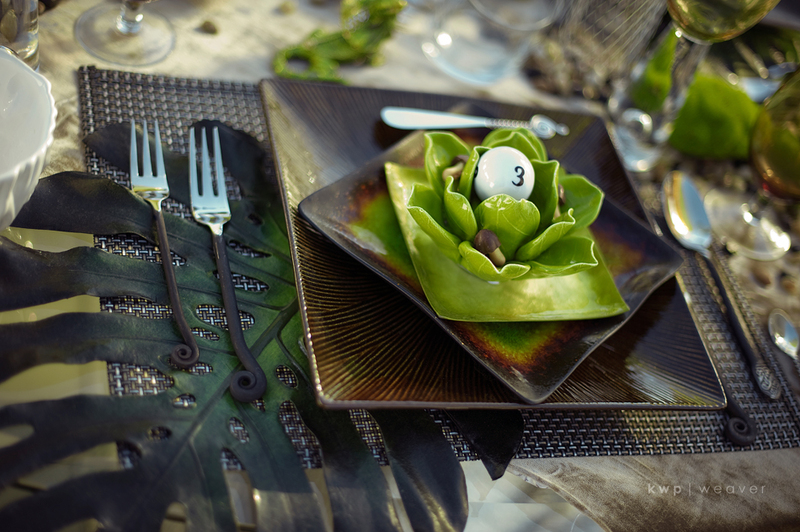 Our theme was based on a “Green Wedding” – but with a little more modern interpretation. We went for more of a spacey-green, instead of your standard organic-green – accenting floral with vegetation and wiring – a little more of an industrial feel. We actually even had these amazing carnivorous plants (and it was really fun telling people that we needed to feed the bouquet)! 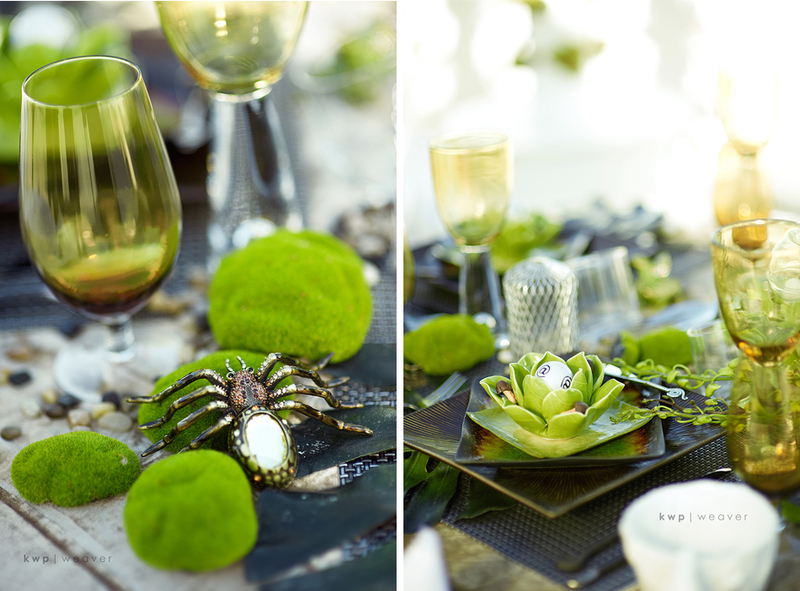 Monkey tails, jeweled tarantulas and moss adorned the reception table. 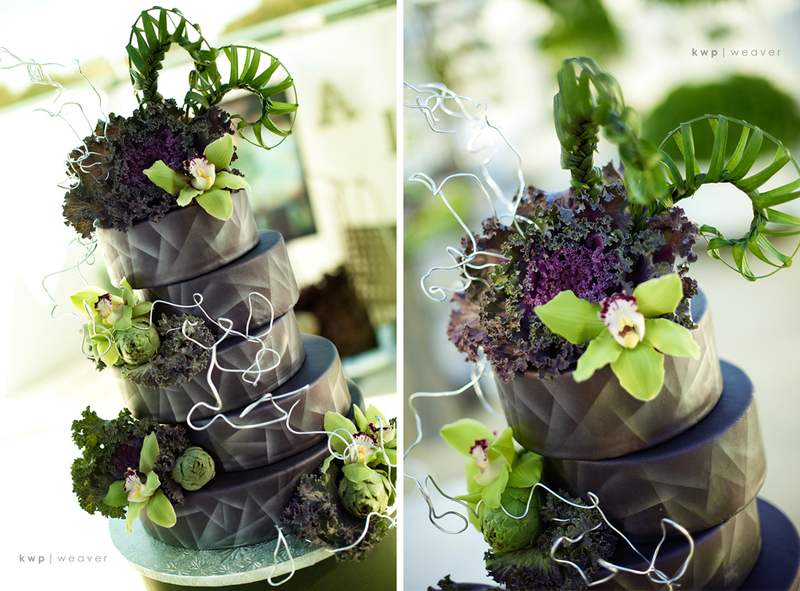 Dryer vents accented the modern decor, and our amazing black tiered cake was airbrushed in metallic and accented with artichoke. I’m particularly proud of this editorial, because the original concept that Melanie and I had discussed truly blossomed from a creative brainstorm session with Lee, Anna and April. It’s so inspiring to watch everyone bring their best ideas to the day! The energy was wonderful and the shoot really surpassed my expectations! And can we just talk about this location! I died when I found it – it’s a complete Hydroponic Greenhouse! Even cooler, it’s tucked away on the roof of the Roper Garden Building, which is adjacent to the Garden Theatre in downtown Winter Garden! 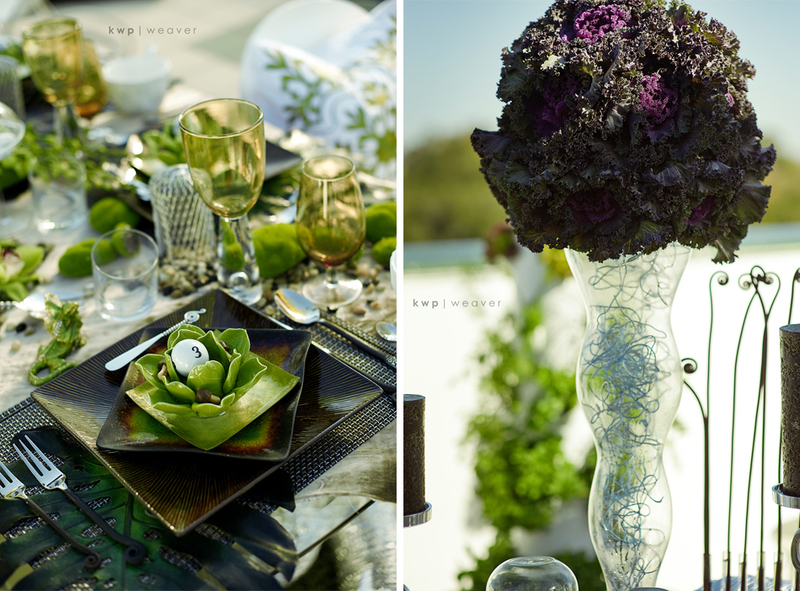 The place was surreal – and such an integral part of bringing together our modern take on a “green” wedding! The Roper Garden Building is the world’s first rooftop greenhouse showcasing sustainable urban food production of food and fish crops in a closed growing system, using environmentally friendly practices. The rooftop “Green Sky Growers” farm produces an abundance of fresh vegetables, herbs, and fish on an annual basis without the use of pesticides. The greenhouse use of environmentally friendly growing practices also includes the harvesting of rainwater that is recycled in the biodynamic growing systems. 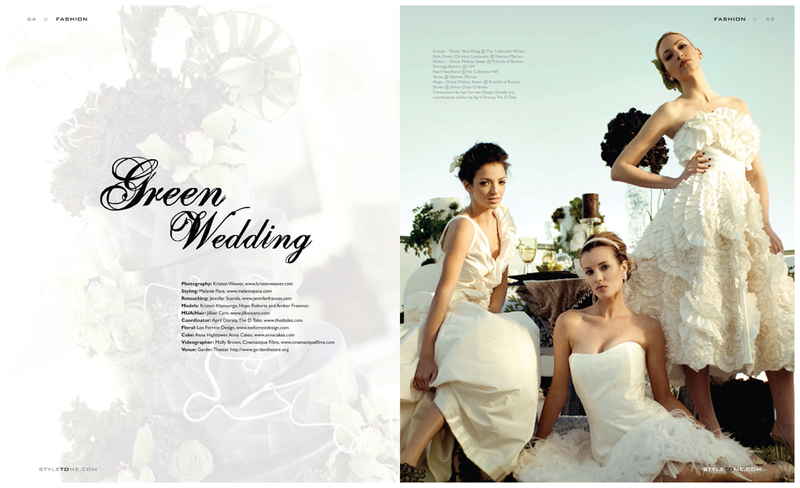 You can view our editorial in the May 2010 issue of Orlando Style Magazine. And to get a glimpse of our day, check out this amazing ‘Behind the Scenes’ video that Molly from Cinematique Films put together for us! 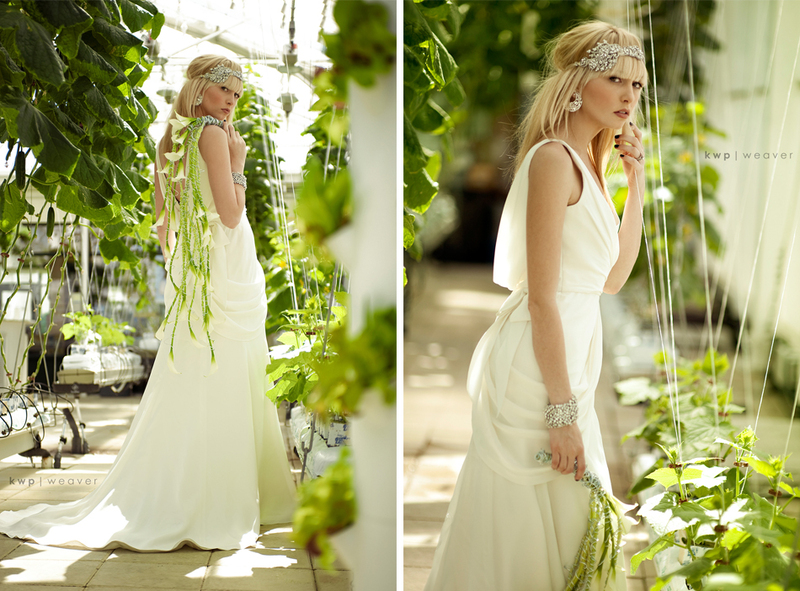 Kristen K. started the shoot in the greenhouse with this amazing “Sunday Rose” Monique Lhuillier gown. And because I like to brag, it’s a platinum set, not-quite-2 carat diamond solitaire. Simple and timeless. I loved the way Melanie accessorized this “Maldives” gown by Reverie by Melissa Sweet. 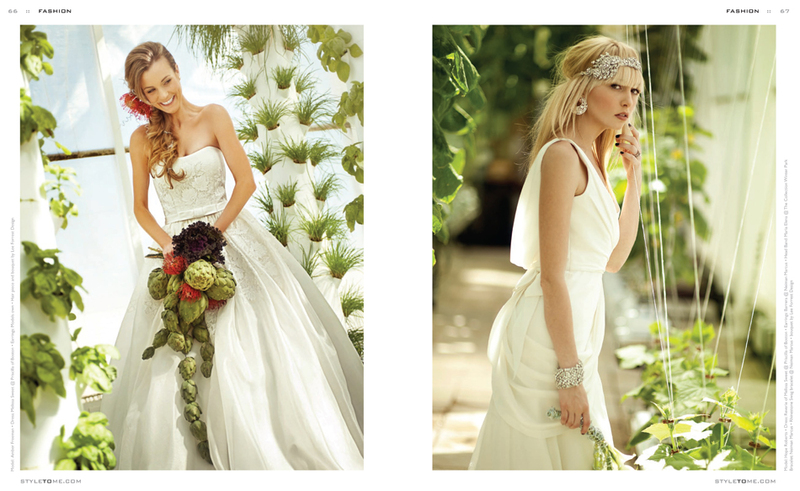 Vintage jeweled headbands are the new birdcage veil. Probably my favorite dress of the day was this “Morgan” ballgown by Vineyard. It has pockets! 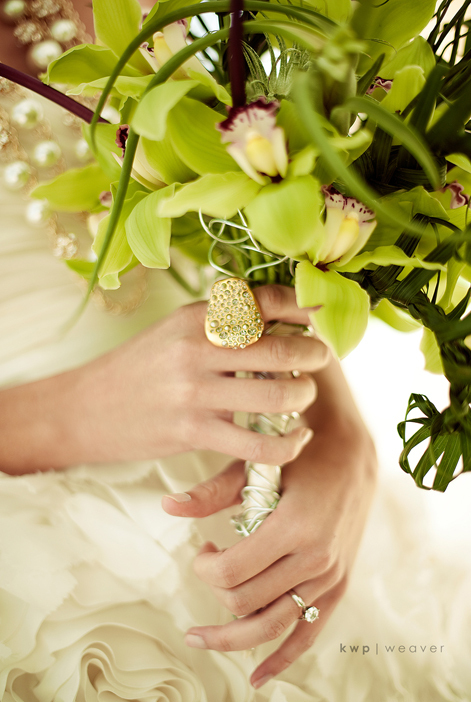 And did Lee not impress on this bouquet?! One of my favorite images from the day. Kristen was rocking this champagne “Diedre” gown from the Spring 2010 Vera Wang Collection. April found this jeweled spider ring box from Z Gallerie. It was one of my favorite accents from the table! Hope is wearing a Tea-Length Melissa Sweet dress, “Billie”. Jillian did some amazing hair and makeup work, and I loved the simplicity of adding lime green cymbidium orchid and anthurium to her style. April pulled this moss-styled shag rug from Pier 1 Imports, and accented it with green floral Gerbera daisy pieces. 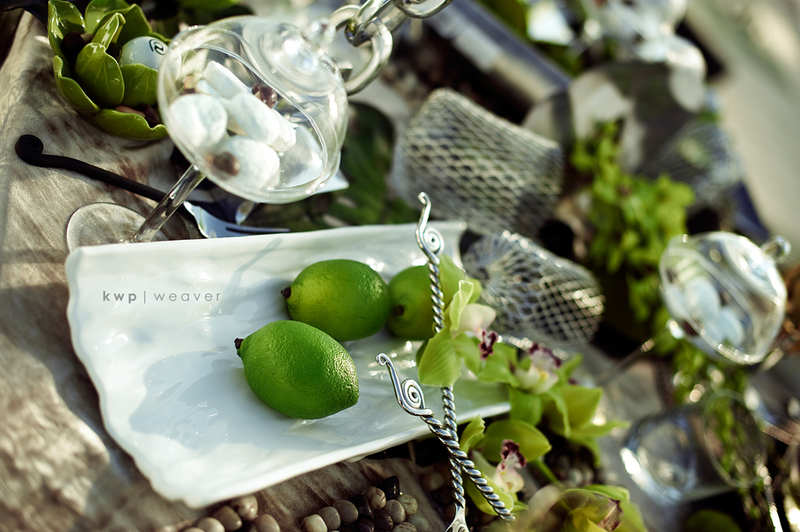 but I love how the utensils match the Monkeytail fern that Lee brought in! 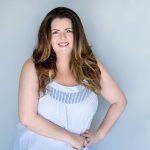 Huge thanks to Z Gallerie on Twitter for putting together a link of all of their amazing items April used for the table ! Ah, I love social networking! 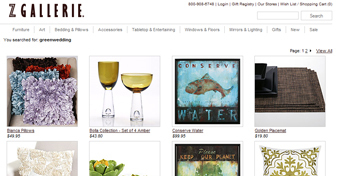 Buy the items used in our shoot at Z Gallerie online! 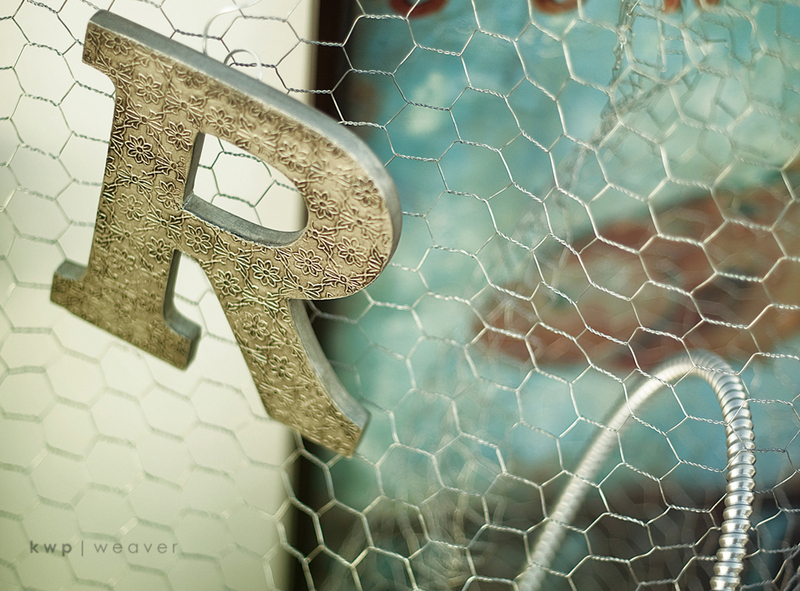 I also have a special little connection with this little guy: a jeweled lizard box from Z Gallerie! Lee’s centerpiece was striking. I loved how original it was. Simple, but made a huge statement! 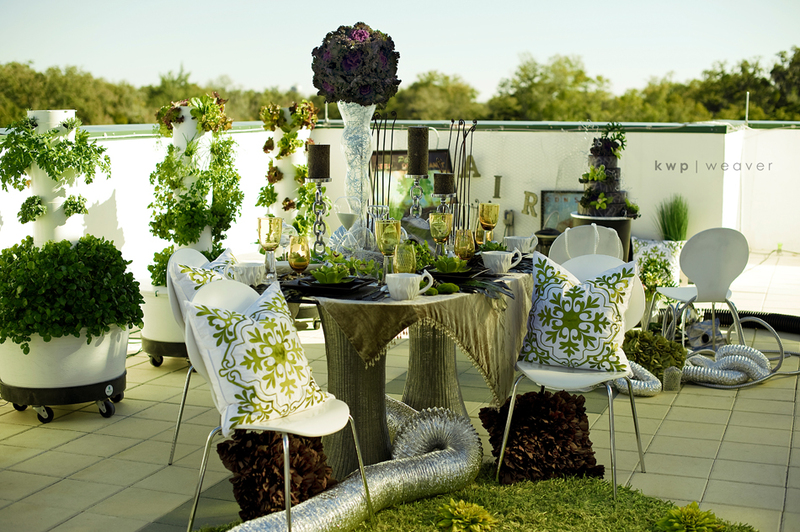 Our rooftop table scape. Table and chairs were provided by the amazing Unique Options! Anna’s cake was seriously amazing. 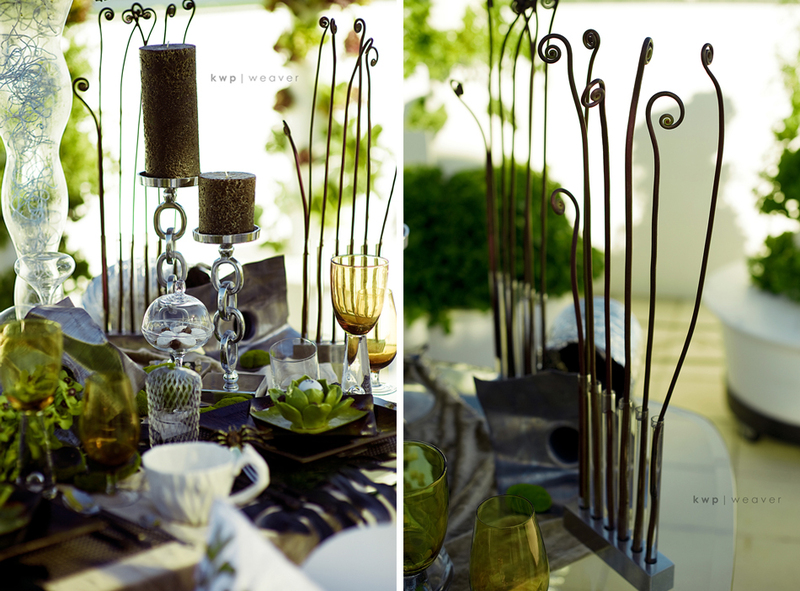 She accented her metallic airbrushed design with artichoke and braided palm leaves, wiring and greenery. Amber wore a cocktail length Priscilla of Boston Platinum Collection dress. 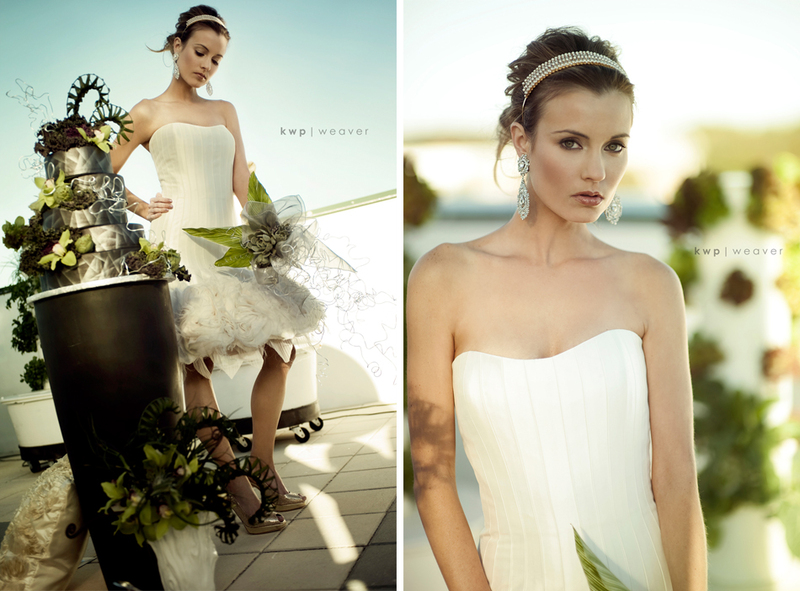 The skirt hem is accented with Chiffon, Tulle and Ostrich feather. Shoes are from Christian Louboutin, Neiman Marcus and Jimmy Choo.